Kareena Kapoor is at present working on her upcoming film Good News which also features Akshay Kumar and Diljit Dosanjh. The team Good News has recently wrapped up filming for the first song and the occasion was celebrated with a cake-cutting ceremony. Kareena’s hairstylist shared a picture from the wrap celebrations on her Instagram account. 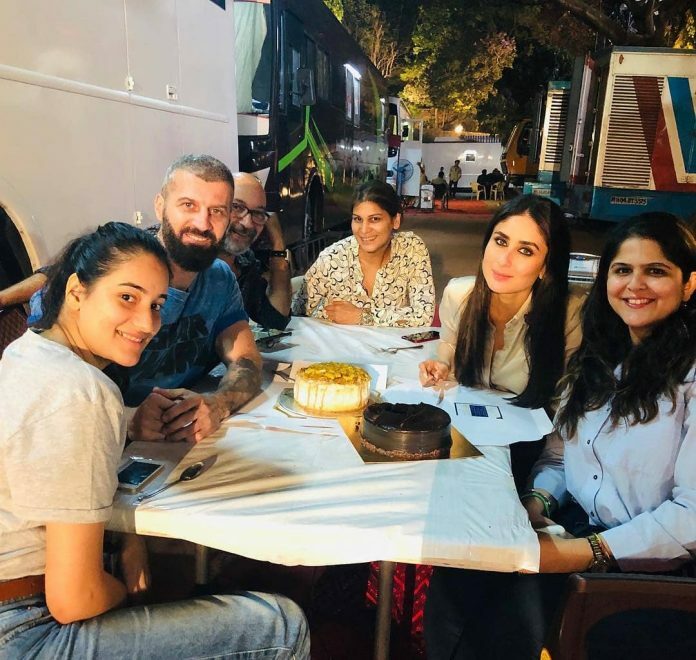 Hairstylist Yianni Tsapatori said, “#dieting #saga always… ‘Good News’ song wrap #kareenakapoor #goodnews #film #movie #bollywood #song #team #pineapplecake #chocolatecake.” Kareena looks stunning in the picture as she sits down with her team post the song shoot. Earlier many pictures of Kareena Kapoor sporting a baby bump during the shoot of the film had surfaced on the internet. The story of the film is about a married couple who are desperately trying to have a baby.